As our Southeast neighborhoods change and redevelop, it makes sense to consider the impacts on the City’s infrastructure. When single-family homes or smaller commercial buildings are replaced by increased commercial and residential density, how does the City account for increased demand on the water, transportation, sewer, stormwater, and open space services? The City addresses those impacts by charging developers System Development Charges (SDCs), one-time fees based on the size and type of redevelopment. SDC exemptions are available under some circumstances, primarily for affordable housing development. There are four bureaus that charge SDCs for most kinds of development. The Water Bureau charges SDCs for changes in use that will use more water (the fee is based on the size of the meter). The Bureau of Environmental Services charges for increased demand on stormwater and sewer systems. The Bureau of Transportation charges SDCs when the proposed use will create more transportation trips than the previous use. Parks and Recreation assesses SDCs on new residential and some commercial development, to provide funds for increased use of parks infrastructure. As SDCs are assessed, they are set aside for certain types of projects that have been designated through a capital improvement plan. Oregon state law (ORS 223.307) requires that the funds be used for the systems for which they were charged, and that the funds are used for improvement projects that increase capacity, and not for maintenance or operations. For example, the Bureau of Transportation uses Transportation SDC funds to provide partial funding for a list of improvement projects across the City. Projects must add capacity to the existing system, and be located on streets that are used more intensely, such as arterials. Projects on local streets do not qualify unless they are identified as City walkways or City bikeways. Parks and Recreation spends SDC funds on capital improvements that increase capacity, such as buying land or building new facilities. For all projects using SDC funding, there must also be funding from other sources, such as federal grants. SDC funds are not allocated to the neighborhood in which they were collected, but are assigned to a pool of money that is spent on projects across the City. 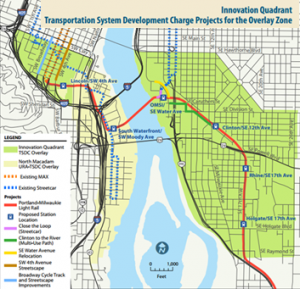 However, there are two “Transportation SDC Overlay” zones in Portland which charge additional SDC funds that remain in the zone. One is in the South Waterfront, and the other, the “Innovation Quadrant,” covers Portland State University and a portion of inner Southeast (including part of the Hosford-Abernethy and Brooklyn neighborhoods). If a development falls into one of those zones, there is an additional SDC cost to the developer, and the funds are spent within that overlay zone. Change in the built environment changes the way that people interact with the infrastructure. As local, state, and national government agencies struggle with maintaining and adding to existing infrastructure, SDCs are one way to address the increasing pressure created by redevelopment.